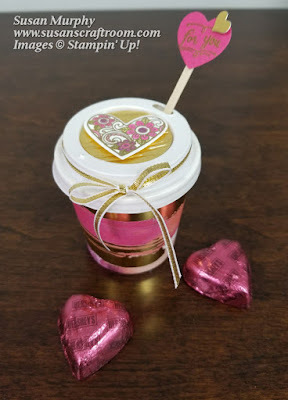 Susan's Craft Room: Anything But A Card Blog Hop-VALENTINE FAVORS! 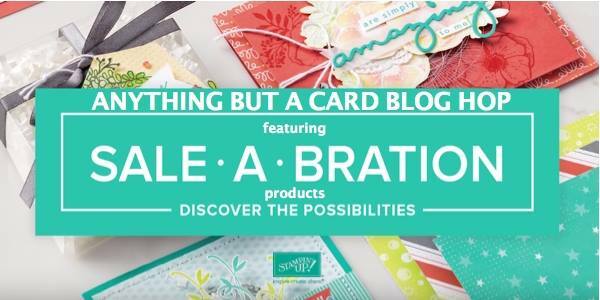 This month's blog hop is all about Anything But A Card. You will get lots of inspiration from these ladies! 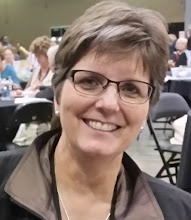 Be sure to click through the entire blog hop and leave some comments for everyone. At the bottom of my post are the products used in my two projects. For my projects I decided to make a couple of valentine favors. They are made so that they can also be used for year round use because there are no Valentine sentiments on them. For the first project I used one of the Mini Pizza Boxes. They are so cute and versatile! They are food safe so you can include food goodies inside if you wish. They are also perfect for a little set of 3x3 cards. I first cut layers of paper for the top & sides. I used the bright and beautiful Painted With Love Designer Series Paper, layered on Melon Mambo Cardstock and Gold Foil Sheets. 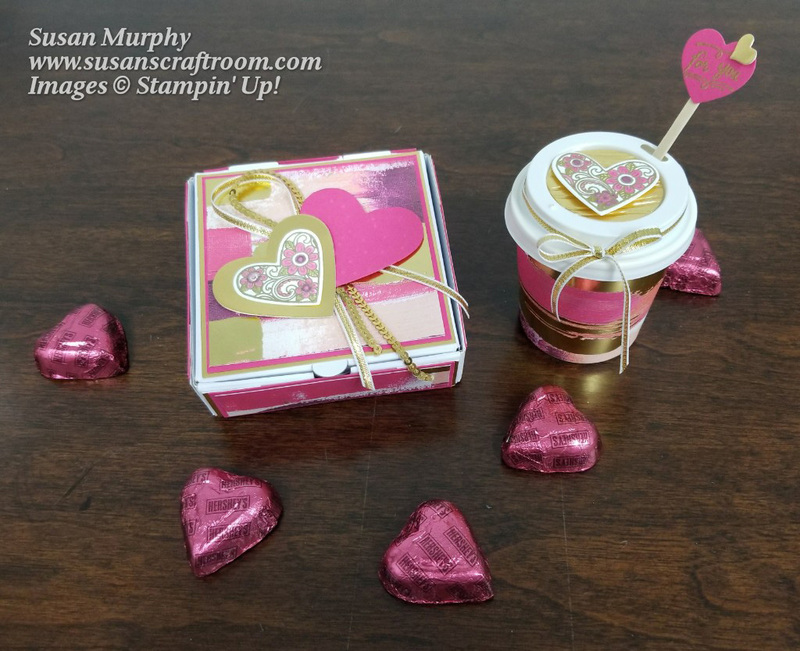 The gold floral heart from the Ribbon of Courage stamp set is heat embossed using Gold Stampin' Emboss Powder and then colored with Stampin' Write Markers. I used the Old Olive, Melon Mambo & Rich Razzleberry Markers. The hearts are cut using the Sweet & Sassy Framelits dies & the Support Ribbon Thinlits dies and popped up with dimensionals. I love the super sweet Gold Mini Sequin Trim! I added that to the top of the box along with some 1/8" Gold Ribbon using Glue Dots. For my second project I finally used one of the mini coffee cups that I ordered a couple of years ago. I love those things! They are so stinkin' cute! I made the little coffee cup favor to coordinate with my little pizza box favor. For the top circle I used the Seaside Textured Embossing Folder to emboss a piece of the Gold Foil Sheets. I then punched out a circle using the 1 1/2" circle punch. It is attached to the cup lid using Glue Dots. 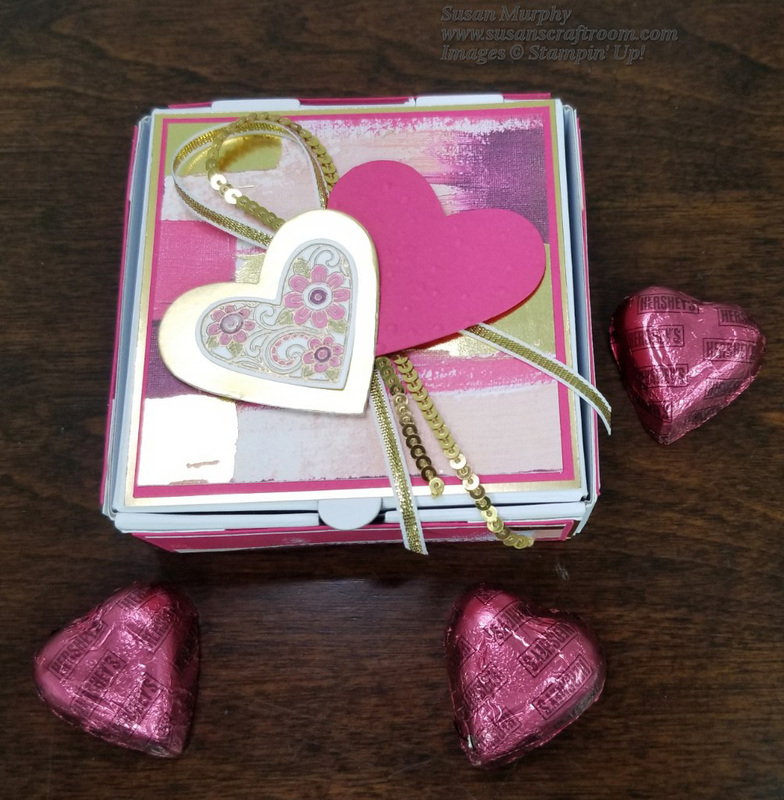 I then added an embossed & colored heart to the top using Stampin' Dimensionals. The sentiment on the small heart on the stir stick is from the Wood Words stamp set. I heat embossed in gold on Melon Mambo Cardstock and cut it using the heart from the coordinating Crate Thinlits and attached it to the stir stick with Glue Dots. The tiny heart is cut using the Mini Treat Bag Thinlits and attached to the Melon Mambo heart with a Glue Dot. The wrap for the mini coffee cup is made using a template that I found on Deb Valder's Blog years ago. It works perfectly! You can order the mini coffee cups and lids from The Webstaurant Store. Hop on over to all the blogs and check out the great projects! Be sure to leave some blog love by leaving comments on the blogs.